The Ho IV was built primarily to investigate the effects of high aspect ratio. Two Ho IVs were built, one of which crashed after entering a spin. The span was the same as that of the H III but aspect ratio was increased from 10.7 to 21.1, and the control system further developed. In order to retain their finless wing layout and get the maximum aerodynamic efficiency, the pilot was put in a prone position with his body in a 27% thickness ratio egg and his knees and legs in a small leg well. The well also supported the rear skid (or wheel in the case of the H IVb). An example of the HIV was found at Göttingen in good condition and was brought back to R.A.E. for test flying. It has completed 500 hours flying since its construction in 1942, including a cloud flight of 1-hour on instruments; such a flight demonstrates that stability and control and the comfort of the prone position must be satisfactory. The three stage control flaps were all geared to the spectable type control wheel and operated on the same general principle as the earlier two flap control on the H III. The following table gives the (measured) flap movements corresponding to full control by the pilot. It will be seen that the outer flap works principally as up going aileron whereas the “climbing elevator” action comes mainly from the middle flap and “diving elevator” action from the inner flap. Down going aileron, needed to neutralize pitching moments, comes from the inner and middle flaps together. The center and inner flaps were unbalanced, with round noses, the tip flaps Friese balanced with a skew hinge giving 39% balance at the inboard end and zero balance at the tip. This scheme gave the required aileron yawing moments without making the control flap at the tip vulnerable when a wing tip scraped the ground. Drag rudders were of the upper and lower surface spoiler type placed immediately ahead of the outer control flap; the upper surface spoiler had a vented web. To open the rudders the pilot had to press with his toes, moving the foot from the ankle against a spring loading on the pedals which gave "feel" to the control. By pressing both feet together he could open both rudders simultaneously, thus giving extra drag for glide control. Rudder operation was said to cause no buffeting of the control flaps. The movement transmission from the pilot’s pedal included a cam plate cut to give no rudder movement for negative movement of the pilot’s foot (i.e., pressure on the opposite pedal) and an approximately linear relationship between pedal movement and rudder projection for positive movement (i.e., pressure on the pedal). All controls were operated by push rods, the inner and central flaps and the drag rudders being moved by skew-hinge cantilevers. In the IVb the skew hinge principle was extended to the outer flap operation also. The method of operating the control flaps was simple to construct and eliminated all external control horns. Longitudinal trim was obtained by an internal bungee “spring” which can be adjusted to take any out-of-balance aerodynamic loads on the elevator control. There were no landing flaps by large spoiler type dive brakes were provided, which could be used to give variable drag for glide path control. The H IV used reflexed cambered sections (zero Cmo) of R.A.F. 34 type, changing to assymetrical section at the wing tip. The large wing dihedral of 5 percent was used to give adequate wing tip clearance. Reimar Horten considered that aerodynamically this might be on the large side but advisable for practical reasons. It should be remembered that both the H III and H IV have an abnormally low value for the lateral relative density Uso that unusual values of Lr and Nv would be permissible without dynamic instability resulting. 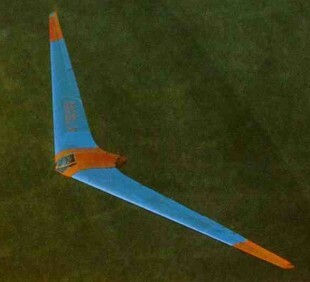 Performance was measured by flying the H IV against the D 30, a conventional high performance glider which had been carefully performance tested by D.V.L. to form a “standard”. The essence of the method was to two both aircraft up together and let them glide down from about 10,000’ at a series of speeds, measuring the relative height photographically, at intervals. From these tests the best gliding angle of the H IV was found to be 1 to 37 and the minimum sinking speed 1.7 ft/sec. Minimum sinking speed was slightly less than the D 30, but at high speeds the d 30 was better. Scheidhauer, Horten’s chief test pilot, has done the majority of the flying in Horten IV’s (about 1000 hrs) and his comments are worth recording. He was a strong advocate of the prone position - in his own words “it has nothing but advantages.” All H IV controls he described as very light, he flew the glider with “two fingers”. The elevator was apparently rather sensitive compared with the aileron but not unpleasantly so. Aileron application produced no adverse yaw - a definite improvement after the II and III - and could reverse a 45 degree banked turn in 5 secs. at 70-90 mph, which is better than the average sailplane. Longitudinal stability he thought satisfactory but he commented on a “wiggle” which was produced by flying through gusts; this is apparently a sharper pitch response than for a conventional sailplane, but well damped, quite harmless and requiring no corrective action by the pilot. A true stall could not be produced with normal elevon adjustment because of increasing static stick fixed stability at the stall, which used up available elevator power before the wing tips were stalled. Spins could only be produced by applying full aileron and rudder with the stick hard back; recovery was easy. Stability and controllability on tow were excellent. Scheidhauer described a competition in which a number of sailplanes were aero-towed form Grunau through the very turbulent air in the “standing wave” from a nearby mountain; the rough air had to be negotiated on tow to get to the area of rising currents. All the instructors from the school at Grunau were flying conventional sailplanes and broke their two lines without exception. Scheidhauer in his H IV managed to get through and soar in the standing wave. He attributed his success partly to his own skill and partly to the good controls of the H IV plus his ability to use the tip rudders together to check surging in the tow rope. Take-off seems to present some problems to a pilot new to the aircraft. It seems that the short undercarriage base, responsive elevator and small wing tip clearance can produce a very erratic take-off if the pilot is not smooth and precise in his control movements. 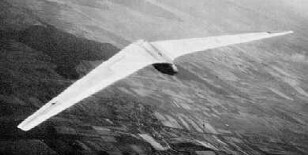 Construction followed the normal Horten practice, but the wing panels were made with detachable tips of sheet clektron. This was necessary because the narrow chord at the tip made accurate construction in wood very difficult. The center section was of welded steel tube, with perspex nose and a large jettisonable access cover behind the main spar. The front skid was retractable and fitted with a wheel which automatically dropped off as the skid retracted. The pilot’s harness was modified from the original version, being a single broad strap passing under the buttocks. This was released by the same handle that jettisoned the access cover. The pilot’s parachute was stowed in a pocket on the cover and connected to the pilots harness by short straps. In this was the pilot was relieved of the weight of the pack, which would otherwise have caused some discomfort on a long flight. Flying instruments included a low reading A.S.I. driven by a venturi, electrical turn and bank indicator, sensitive variometer, high reading variometer, altimeter and clock. Oxygen equipment comprised two bottles, pressure gauges, reducing valve and economizer, and provision was made for electrically heated clothing. Ventilation was under the pilot’s control. The pilot position could be adjusted for varying pilot size and a chin rest with adjustment for height was provided. The pilot was prevented from sliding forward by shoulder rests and the reaction of his thighs against the knee well. Comfort appeared to be satisfactory when we tried the bed but elbow and shoulder movement was restricted which constrained one to stay in the same position all the time. Superficially the IVb resembles the IV very closely but the aerodynamic changes were a fundamental experiment. The Hortens intended to produce a laminar flow sailplane with superlative high speed performance - in this they were partially successful but they sacrificed too much on the stability and control to make the venture a real success. Production had been started, prematurely, at the rate of about two a month. Wing sections were derived from the Mustang section which had been measured by D.V.L. for captured aircraft and tunnel tested. The Hortens were excited by the low tunnel drag figures and designed the H IVb to exploit them. The root section was the original Mustang profile, changing to an uncambered section with the same fairing shape but reduced thickness at the tip. Wing twist was reduced (compared with the IV) to 5.6 degrees to get the greatest spanwise extent of laminar flow, and sweepback reduced to 2 degrees to get the CG farther back relative to the mean chord (this was necessary because the aerodynamic center of the basic wing section was farther aft). 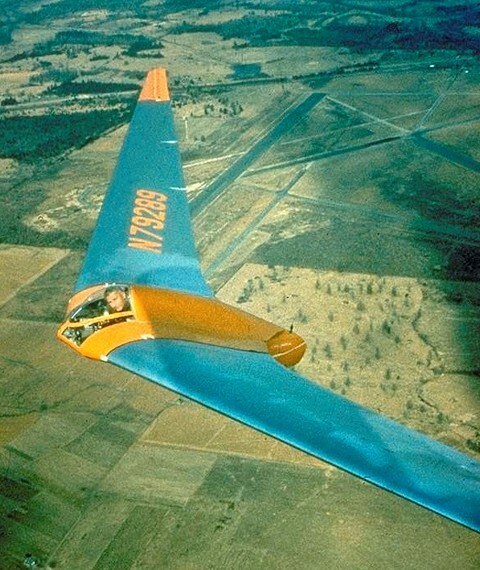 It is interesting that although Cmo was not zero for the root section, the high aspec ratio enabled the glider to be designed to trim, elevons neutral, at the required top speed (140 mph) without needing excessive twist. The wing structure ahead of the main spar was a ply sandwich monocoque with Tronal filling. Tronal was an expanded wook with specific gravity 0.1 to 0.09, invented by a Dr. Barschfeld of Dynamit A.G., Troisdorf (near Cologne). The sandwich was made up on molds, with outer ply 1 mm thick and inner ply .8 mm; the filling was 20mm at the root tapering to 5 mm at the tip. The nose sections were stuck onto the front of the main spar with supporting ribs every 2 meters. Between the main and rear spars normal ply covering was used, insufficient Tronal being unavailable for sandwich construction all over. Waviness in a chordwise direction was not controlled or measured. Sag (spanwise) between ribs had been measured on the IV and eliminted on the IVb. Special care was taken to kep dust off the wings; wing dust covers were made and all handling was done with gloves on. No transition measurements were made on the IVb, but it was flown against a calibrated IV and the following relative sinking speeds measured. The change of section raised the stalling speed from 45 kph on the IV and to 60 kph on the IVb. The handling characteristics were very unsatisfactory. A wing tip stall occurred followed by wing dropping and spinning. The first aircraft crashed for this reason after the pilot got into trouble in a cloud. An attempt was made to improve matters on the second glider by clipping the span from 20.25 meters to 18.5 meters but results were disappointing. As a cure on the final design a reversion to the old H IV tip section was proposed, the theory being that section stalling characteristics were bad due to the sharp nose radius. Partial breakaway behind the maximum thickness point was suggested, aggravated by spanwise boundary layer drift which rendered the elevon ineffective. Horten thought the small wing tip Reynolds number made the use of low drag sections inadvisable.